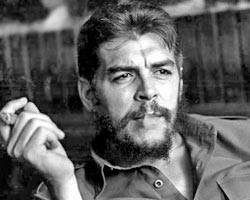 Simply Jews: Believe it or not: Che Guevara is Jewish! 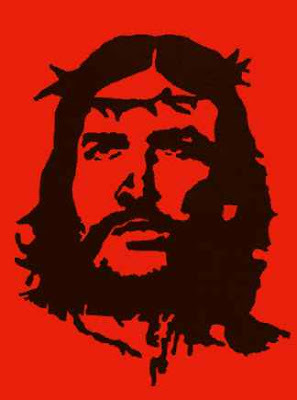 Believe it or not: Che Guevara is Jewish! (Being of pluralistic persuasion, I allowed you to settle on a picture of your choice. You may try to guess which one I like most, but no prizes.) The story is translated from Russian with the kind assistance of Babelfish (due to my laziness), so apologies for the result (selected quotes only). Some see in him a fanatic and pitiless killer, who was desperately rushing forward seeking death, leading the naive and blindly devoted to him people, foolhardily taking other people's lives in the name of questionable and erroneous ideas. Others consider him a glorious hero, defender of weak and oppressed, romantic leader of entire generations of youngsters. Who was he in reality, this ardent Latin American revolutionary, who reached the peaks of authority on “the island of freedom" and was killed in the foreign land, the object of devotion by his friends and of hate to his enemies even after death? Only forty years after the death of Ernesto Guevara, the declassified materials from the archives of intelligence services of super-powers opened to us the true background of the improbable and tragic events, which overturned the life of Comandante. New documents bared with penetrating clarity the dramatic fate of the hero, who learned the secret of his Jewish origin, returned to his people and faith and died in search for salvation of the land and people of Israel. Probably, everything began at the end of 1964. Possibly then Ernesto's mother, sensing close death (she will die in May 1965) disclosed to her son the surprising history of its life. Celia De La Serna was borne in 1908 into Buenos Aires religious family of Jewish emigrants from Russia. Girl named - Celia in memory of her aunt killed during the pogroms. Until age of eighteen Celia Sheinerman grew in the closed and stuffy emigrant ghetto, getting traditional Jewish education. However, upon official maturity, she immediately left the parents' house and religion, changed her Jewish name and only an year later married Ernesto Guevara Linch, a native of Argentina a. A year later she gave birth to Ernesto. Neither Che nor his four brothers and sisters ever suspected their Jewish roots. Celia has thoroughly hidden her Jewishness, without telling about it even to her husband. Nevertheless, not long before death, she entrusts her secret to her dear son. The shaken Che learns that, according to Jewish tradition, he is a Jew and that in the old world he has close relatives along the maternal line. Celia knew from her parents that her brother Samuel, eighteen years older than she, remained in Russia. Like her sister, he left the house of his parents, for Zionist reasons, after refusing to go into Argentina. Celia knew about him only that after the departure of his parents, he left to Caucasus, and from there moved to Palestine. It is only possible to guess the confusion caused by the revelations of his mother in Che's soul. Never before thinking much about Jews or about Israel, he begins to study greedily everything he can find about his people. The Jewish state, liberated from the British colonial regime, that knew how to protect itself from the bourgeois Arab regimes won his sympathy in early days, but now he feels that something stronger connected him to Israel. On 19 February, 1965, Guevara arrives to Egypt. In the United Arab Republic, which included then Egypt and Syria, Che will stay for a week week until 24 February. And then on 1 March he reappears in the Nile valley, remaining in Egypt for almost two weeks. But where has the Cuban minister spent the days between February 24 and March 1? The answer to this question became known only in 2007, when some CIA documents were declassified. On 25 February, 1965, Guevara leaves Egypt for Cyprus, and from there arrives to Israel, having for the first time entered the land of his ancestors. Guevara arrives in Israel incognito, he turns himself to the emigration service in Haifa in the almost futile attempt to find the family of his uncle; and the miracle happens: he reveals that he has a cousin of the same age! However, the cousin also did not preserve the parental surname. 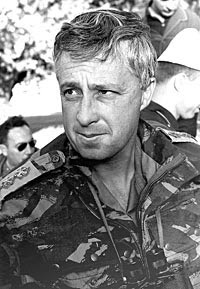 Eventually Ernesto Che Guevara meets in in Tel Aviv this cousin, the commander of the division of the combat training section of general staff, recently promoted to the rank of Major General - Ariel Sharon. Guevara again levels charges at the USSR, hinting that it "sells its aid to people revolutions", for its own profit. In Moscow the speech is perceived as an insult, relations between Che and Fidel Castro are damaged finally. On 14 March Comandante arrives into Havana, and on April 1 he writes the farewell letters to his parents, children and his former nearest friend - Fidel, in which, he rejects the Cuban citizenship. In spring of 1965 Che leaves Cuba, heading in unknown direction. According to the official version, Che appears in the Belgian Congo, where allegedly he trains the partisans for the purpose of the overthrow of government. However, the extremely unsuccessful shooting war in Congo proves the fact that for Che the Congo is only a cover. In reality, he does not stay in Africa and arrives in Jerusalem immediately. The cousin acquaints Guevara with his friend and contemporary - rabbi Eliyahu Shaar Ishuv Cohen, who occupies at that moment the post of the deputy mayor of the capital. Under the guidance of Shaar Ishuv Cohen, Guevara begins his way to the Jewish tradition, studying Tora in central yeshiva of religious-Zionist movement - Yeshivat Merkaz Ha Rav. There is more, much, much more in the story, but I am exhausted and our field operatives shall gather more information, so I shall quit here. I am sure that you are exhausted too by now, and that your flabber is thoroughly gasted. Only one thought would not leave my tired brain. What does this news do to the poster industry? Che Guevara is Jewish. It is final. Gimme your squirrel or else! On the surface, it all makes sense.